The large, fast-moving mudslide that buried much of Oso, Washington in March 2014 was the deadliest landslide in U.S. history. Since then it’s been revealed that this area has experienced major slides before, but it’s not known how long ago they occurred. 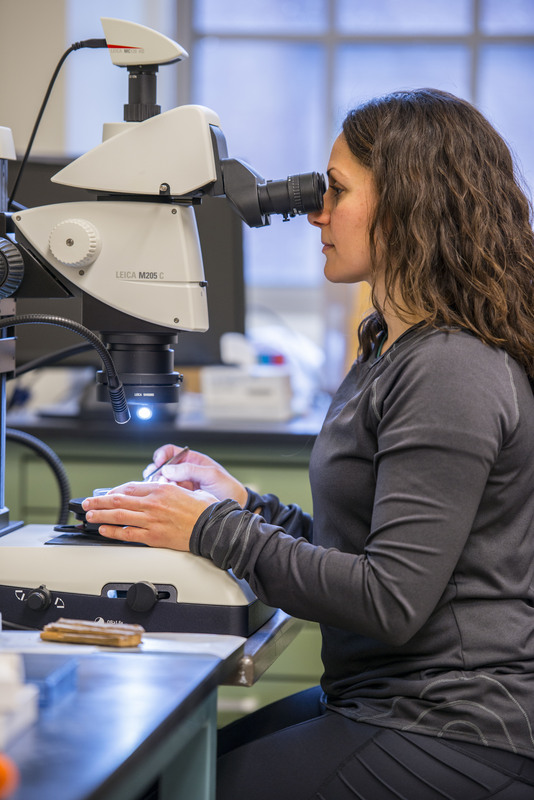 University of Washington geologists analyzed woody debris buried in earlier slides and used radiocarbon dating to map the history of activity at the site. The findings, published online Dec. 22 in the journal Geology, show that a massive nearby slide happened around 500 years ago, and not thousands of years ago as some had believed. “This was well known as an area of hillslope instability, but the question was: ‘Were the larger slides thousands of years old, or hundreds of years old?’ Now we can say that many of them are hundreds of years old,” said co-author Alison Duvall, a UW assistant professor of Earth and space sciences. LaHusen had not yet begun his graduate studies when he asked about studying the history of geologic activity at the Oso site. In late summer of 2014, the researchers began their work wading along riverbanks to look for preserved branches or trees that could be used to date previous landslides. 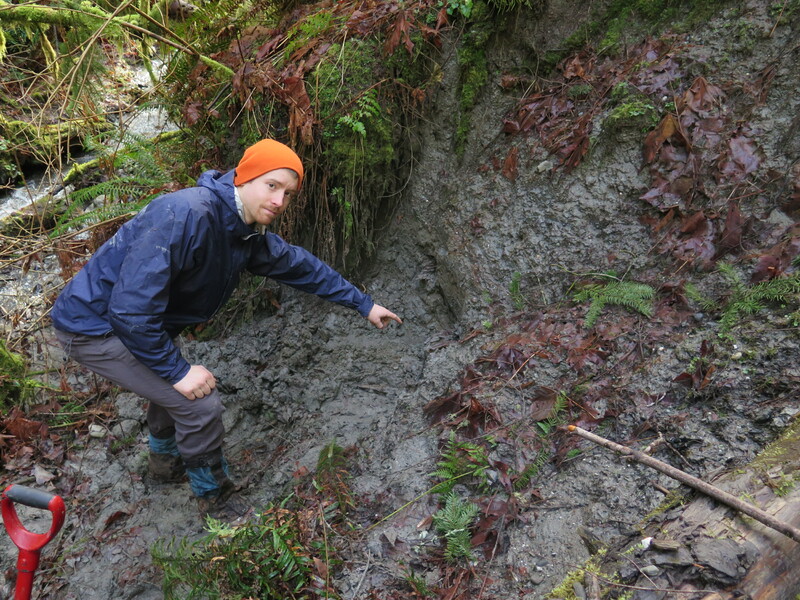 The team managed to unearth samples of wood buried in the Rowan landslide, just downstream of the Oso site, and the Headache Creek landslide, just upriver of the 2014 slide. 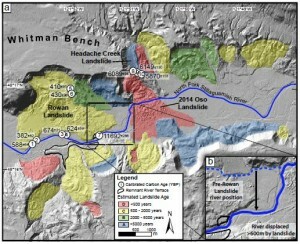 Results from several debris samples show that the Rowan landslide, approximately five times the size of the Oso slide, took place just 300 to 694 years ago. 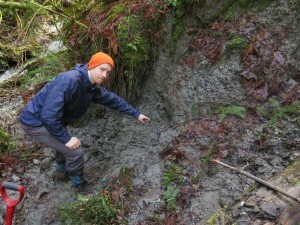 The Headache Creek landslide is within a couple hundred years of 6,000 years old. 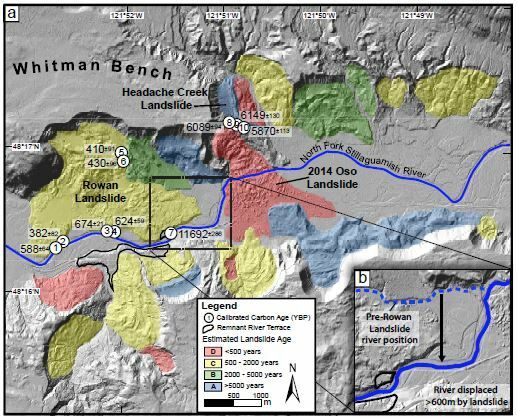 Previous UW research had shown a history of geologic activity at the Oso site, including previous major landslides and a recent small slide at the same slope that collapsed in 2014. But while the position of past slides and degree of surface erosion can show the order that the older slides happened, it has not been possible to give a date for the past events. The new study uses the radiocarbon dates for two slides to establish a roughness curve to date other events along a 3.7-mile (6-kilometer) stretch of the north fork of the Stillaguamish River. A roughness curve uses the amount of surface erosion to establish each slide’s age. The two dates put firm limits on the curve, so that other nearby slides can be dated from their roughness characteristics without having to find material buried inside each mass of soil. Applying the new method for other locations would require gathering samples for each area, they cautioned, because each site has its own soil composition and erosion characteristics. It’s not known whether the findings for the Oso site’s history would apply to other parts of the Stillaguamish River, Duvall said, or to other places in Washington state. The researchers are still studying debris from other locations. But the results do have implications for the immediate area. “It suggests that the Oso landslide was not so much of an anomaly,” Duvall said. She and LaHusen are also working with the UW’s M-9 Project, which is studying hazards from magnitude-9 earthquakes along the Cascadia subduction zone. They would like to learn whether landslides across Washington state coincided with past earthquakes, and use simulations of future shaking to predict which places in the state are most vulnerable to earthquake-triggered landslides. Other co-authors on the new paper are David Montgomery at the UW and Adam Booth at Portland State University. The study was funded by the National Science Foundation, the Geological Society of America, and the UW’s Quaternary Research Center. For more information, contact Duvall at 650-815-5560 or aduvall@uw.edu and LaHusen at seanlah7@uw.edu. Note: Duvall and LaHusen are currently out of town and best reached via email. Duvall is on the East Coast and will be on campus Sunday, Dec. 27, and then doing fieldwork in New Zealand from Dec. 28 to Jan. 16. LaHusen will be back on campus Jan. 4. More photos are posted at www.bitly.com/osolandslidehistory.